Diane Keaton Tries to Get a Date With Bono on EllenShe doesn’t care if U2 frontman “Mr. Bono” is married. 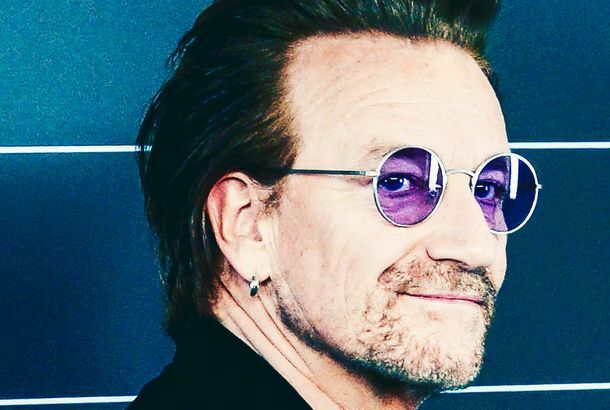 European Mayor Desperate for Bono to Visit His Local MallThe (allegedly) tax-dodging mall needs his star power. Jimmy Kimmel Basically Let U2 Have His Show Last NightThe band talked about the Manchester bombing, Trump, and played two songs — one new and one much older. Jimmy Kimmel and Bono Assembled A-lister Supergroup to Sing for AIDS AwarenessNeil Patrick Harris! Julia Roberts! Kristen Bell! DJ Khaled! Channing Tatum! Halsey! Bono and U2 Desi-i-i-i-ire That You Don’t Vote for Donald TrumpBono wasn’t subtle with his political opinions during the iHeartRadio Festival. 8 Hot Irish Guys for St. Patrick’s DayPlease enjoy responsibly. Selena Gomez and Cara Delevingne Partied in Saint-Tropez Plus Leonardo DiCaprio, Rachel McAdams, Mick Jagger, and more highlights from this week’s parties. Bill Clinton Did the World’s Worst Impression of AnyoneOf Bono, specifically. Bono Does a Pretty Okay Bill Clinton Impression for Someone Who Is BonoWatch it. Bono Is a Facebook Billionaire, ProbablyCongrats, Bono. A Brief History of Other Fake BonosDon’t worry, Hannity, mistaking Bono impersonators for the real thing happens more than you might think. Tutu and Bono Eat CakeCalories don’t count for these guys. Swizz Beats and Bono Take Their Relationship to the Next LevelThey’re collaborating! Bono Just Got Around to Seeing Spider-Man: Turn Off the Dark Last NightSeems a bit late, no? Bono Has Nearly Annoyed at Least One World Leader Into Helping Poor CountriesBerlusconi was intimidated, at least. Spider-Man: Turn Off The Dark Delayed Yet AgainIt will now open sometime in February. Foxwoods Theater Already Working on a Spider-Man Contingency Plan?The theater’s G.M. is asking Broadway producers if they have any musicals that might be a “future fit” for the theater. No One Killed at First Spider-Man PreviewBut what did go wrong? What Do Danger Mouse, Spider-Man, and Lady Gaga’s Producer Have in Common?They’ll all be working with U2 on new music!